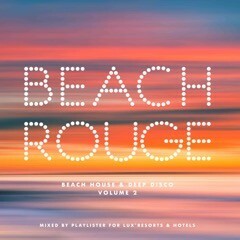 ‘Beach Rouge Volume 2’, is the second release in the Beach Rouge series, featuring beach house and deep disco. Out now on Playlister Records, the 13 track digital album captures the ambience of the Beach Rouge bar at the LUX* Belle Mare resort in Mauritius. With Playlister as music advisors and programmers, the modern music policy of LUX* Resorts and Hotels, complements these beachside retreats, as typified by the laid-back grooves of ‘Beach Rouge: Volume 2’. DJs Dan Lywood and Ben Bridgewater, founders of music curation specialists Playlister.fm, once again take the reins to deliver a mix for a summer getaway. Featuring the likes of the Balearic beach house of Sweed ft Jalana ‘Finally’, the disco of Hot Toddy’s remix of Oh Yeah ‘Nothing But The Beat’, the deep piano of Ridney’s ‘Left My Heart At Mambo’ through to the uplifting energy of Eli & Fur ‘You’re So High’, this album is an odyssey through possibly some of the finest beach house and deep disco out there. It’s available as a continuous mix; a remedy for the winter blues, or as unmixed tracks. Beach Rouge is apparently where the cool and the colourful gather to sip cocktails and soak up sunsets, before taking to the dancefloor. Occupying a prime spot right on the sands and with views across the Indian Ocean, beach cocktails and tapas make for lazy days and cool evenings by the Indian Ocean: flop down on cushions on the beach to the upbeat sound of DJs. The line up of 2016 visiting DJs includes NTS Radio founder, Femi Adeyemi, London ’s Tasker, Eglo Records boss, Alex Nut, and many more throughout 2016.